Abstract. Airborne measurements of CO2, CO, and CH4 proposed in the context of IAGOS (In-service Aircraft for a Global Observing System) will provide profiles from take-off and landing of airliners in the vicinity of major metropolitan areas useful for constraining sources and sinks. A proposed improvement of the top-down method to constrain sources and sinks is the use of a multispecies inversion. Different species such as CO2 and CO have partially overlapping emission patterns for given fuel-combustion-related sectors, and thus share part of the uncertainties related both to the a priori knowledge of emissions and to model–data mismatch error. We use a regional modelling framework consisting of the Lagrangian particle dispersion model STILT (Stochastic Time-Inverted Lagrangian Transport) combined with the high-resolution (10km× 10km) EDGARv4.3 (Emission Database for Global Atmospheric Research) emission inventory, differentiated by emission sector and fuel type for CO2, CO, and CH4, and combined with the VPRM (Vegetation Photosynthesis and Respiration Model) for biospheric fluxes of CO2. Applying the modelling framework to synthetic IAGOS profile observations, we evaluate the benefits of using correlations between different species' uncertainties on the performance of the atmospheric inversion. The available IAGOS CO observations are used to validate the modelling framework. 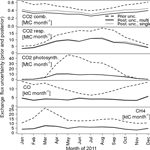 Prior uncertainty values are conservatively assumed to be 20%, for CO2 and 50% for CO and CH4, while those for GEE (gross ecosystem exchange) and respiration are derived from existing literature. Uncertainty reduction for different species is evaluated in a domain encircling 50% of the profile observations' surface influence over Europe. We found that our modelling framework reproduces the CO observations with an average correlation of 0.56, but simulates lower mixing ratios by a factor of 2.8, reflecting a low bias in the emission inventory. 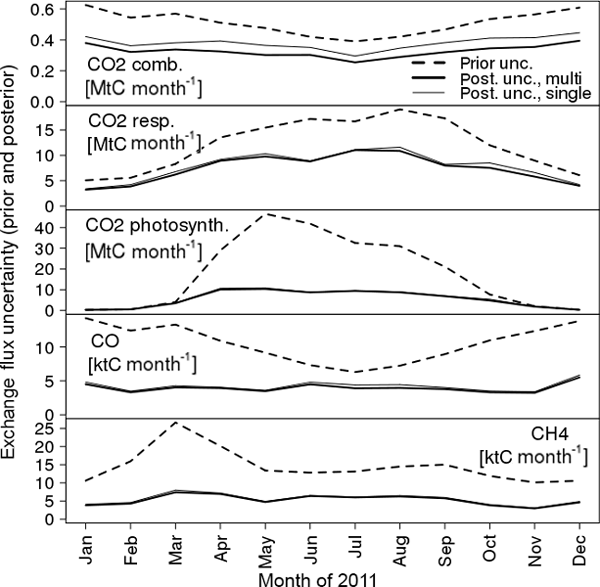 Mean uncertainty reduction achieved for CO2 fossil fuel emissions is roughly 38%; for photosynthesis and respiration flux it is 41 and 44% respectively. For CO and CH4 the uncertainty reduction is roughly 63 and 67% respectively. Considering correlation between different species, posterior uncertainty can be reduced by up to 23%; such a reduction depends on the assumed error structure of the prior and on the considered time frame. The study suggests a significant uncertainty constraint on regional emissions using multi-species inversions of IAGOS in situ observations. How to cite: Boschetti, F., Thouret, V., Maenhout, G. J., Totsche, K. U., Marshall, J., and Gerbig, C.: Multi-species inversion and IAGOS airborne data for a better constraint of continental-scale fluxes, Atmos. Chem. Phys., 18, 9225-9241, https://doi.org/10.5194/acp-18-9225-2018, 2018. Retrieving surface–atmosphere fluxes from the combination of atmospheric observations with atmospheric transport models can benefit from combining multiple species in a single inversion. The underlying effect is that species such as CO2 and CO have partially overlapping emission patterns for given sectors and fuel types and so share part of the uncertainties, both related to the a priori knowledge of emissions, and to model–data mismatch error. We show this for airborne profile data from IAGOS.